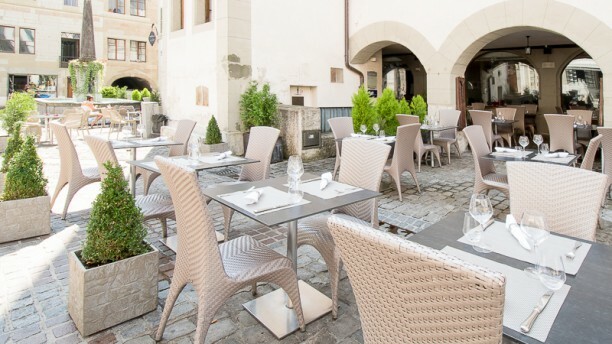 RESTAULOUNGE – Le Khana Mandir, en plein centre-ville de Nyon, rafraîchit la notion de restaurant indien : le lieu, d’un goût exquis, joue la discrétion chic avec du mobilier gris perle, distribué en intérieur et en extérieur sous les voûtes de la place du Marché. CUISINE INDIENNE DU MARCHÉ – La cuisine indienne du chef Prem Singh Rawat va vous emballer. Il vous propose une carte de saison, alliant les produits régionaux aux saveurs traditionnelles indiennes. Daurade royale tandoori ou biryanis, c’est à vous de voir. LOUNGE AU MUMBAI BAR – Indissociable du Khana Mandir, le Mumbai Bar est un lieu incontournable au coeur de Nyon avec sa grande terrasse : café - bar lounge - Indian tapas... Idéal pour un “afterwork”. Food is good, although a bit overpriced. For instance CHF 36.- for a vegetarian Thali is exaggerated. Service is friendly but a bit slow considering the small number of tables. Always a nice evening out. Food was amazing and our server, as usual, was great. All good, but 1 hour wait to get served main course is too long. Delicious food and very friendly service. Had a lovely evening there. Very good food. It was our first time there, and it was a pleasant surprise. Everything we order was really good. That's a place to come back. Delicious food. Great curry selection cooked to your preference. Service always friendly and cheerful ???????? While we enjoyed the food today, I realised when I reached home and checked the bill that I have been billed an extra CHF 5.50 for Evian 50CL. This, though we had not ordered nor were we served any water. Thank you for refunding this amount to me. Excellent indian food, great taste, been here before, but this time it was better than before! The food was excellent and the ambience as well. Will definetly return !